As I detailed in my last article, 1 Peter is a letter written to suffering people. Peter reveals three reasons for why Christians suffer in this life: Sin, Salvation, and Self. To read more about that, click here. His purpose in the letter is to teach Christians how to suffer well. The key is SUBMISSION. Suffering Christians have to submit to God. This submission is an active (or intentional) submission. Peter tells us to entrust ourselves to God “while doing good.” We can’t roll over and just let life happen to us. “Let go and let God” is a deceiving quip - and not a part of Peter’s theology. We are to grab our suffering by the horns and grow from it. Over and over, Peter points to Jesus as our supreme example of how to handle suffering. So what was Jesus’ response to hardships? Here are a few thoughts. I’m sure you can come up with many more. (1) He loved his persecutors. (2) He was patient with those who deserted him. (3) He suffered joyfully [Hebrews 12:2]. (4) No hatred, no revenge, no threats. (5) He was never angry with God. (8) He never returned evil for evil [1 Peter 3.9]. 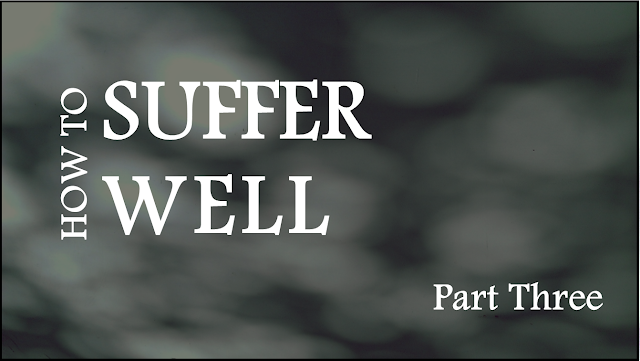 Jesus comes up over and over in this letter as our example of how to suffer well. He pursued his crucifixion with a determined attitude as he submitted to God and his tormentors. (see 1 Peter 2:21–24; 3:18; 4:1; 4:18–19).